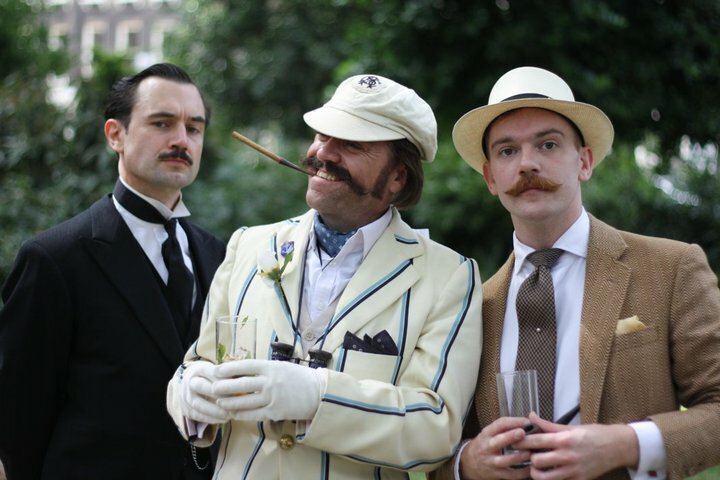 Yesterday’s ‘Chap Olympiad’ (held in leafy Bedford Square, WC1) proved the success that can only be levied when lashings of Pimms, vintage clad vixens and chaps of rakish behaviour abound. As described, each year the annual gathering of the stylish, the caddish and the downright eccentric meet to celebrate a very English version of gentleman’s ultimate sports which include the Three Trousered Limbo, the Cucumber Sandwich Discus, The Hop, Skip and a G&T and and the Pipe Smoker’s Relay, all in the hope of going home with the coveted gold cravat. I simply loved the game where women accumulated on stage simply to slap the gentleman for being flirtatious bounders. This game proved most popular and I’d have felt sorry for the chaps but as I know quote a few of them, they probably deserved it at some point. The uniform clad Heidi Heil gave instructions on each game while the glamorous Miss Fleur De Guerre tallied points …loosely. The victorious winner of 2010 gold cravat was The Great Colonesse. Clad in a leopard print strongman’s outfit with gladiator sandals, flowing locks and lots of real tattoos. He was abetted to his winning status by his gorgeous little blonde daughter who stole the show. She was his secret weapon. Michael Atters Attree took second place (as usual) to the expected and deserved boos and hisses. Readers, this man (pictured above) makes Terry Thomas appear like a saint. Third prize went to (and I quote infamous Chap, Torquil Arbuthnot) a pretty girl with an enormous cleavage, simply because of that. Reason enough. On the style front, I was uplifted by the amount of red haired Retro chicks, the sheer glamour of the girls and the very proper gentlemen’s attire complete with waxed moustaches. This attention to detail and high camp frivolity with an outrageous sense of humour could only be held in England. It made me smile. Lots. One simply can’t wait till the next meet up. I’m already practicing my victory rolls. Did you attend the Chap Olympiad? What was your favourite part of the day? Did you spot a favourite outfit? Please leave a comment in the box below or in the ‘shout mix’ comment box on the right. Next post: New MAC/Rodarte product names causes Bloggers fury.